Fawkner is a friendly residential suburb of Melbourne, just a 25 minute drive north of the busy CBD. The beautiful parks and great local atmosphere make it perfect for your next holiday to Victoria, and you'll be close enough to all of the city's attractions to enjoy your stay. 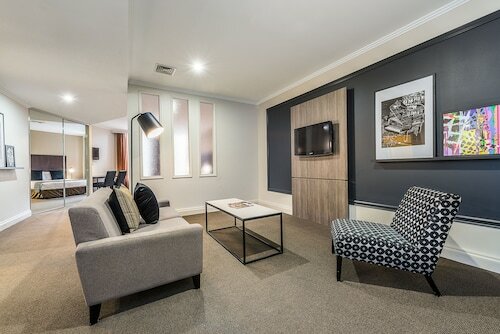 Book your Fawkner hotel today and come experience the best of Melbourne! Spend a lovely day in Fawkner Park enjoying the picnic facilities or the wide open spaces, which are great for a game of football or throwing a frisbee around. Walk through the Moreton Bay fig trees, elms and oaks, or head to the tennis courts and have a game. There's a wonderful cafe next door for some refreshments after you finish. The main commercial areas in Fawkner are dedicated to the automotive industry, and it's a fantastic spot if you're looking for a new car. For everyday shopping, Bonwick Street has great boutique stores and a range of local designer fashion. Grab dinner at one of the Italian restaurants in the neighbourhood, which are some of the best in Melbourne. If you're looking for something a bit more adventurous, hire a bike and try the Upfield Bike Path or the Western Ring Road Trail. Both of these are excellent cycling tracks, and are a pleasant escape into nature. Sports lovers can check out a game at the Melbourne Cricket Ground, or if nature is more your thing, the Botanical Gardens displays over 50,000 different plants in their 36 hectares of natural landscaping. Explore the wonders at the National Art Gallery of Victoria, which is also the oldest art gallery in Australia. If you want to get up close to some animals, the Melbourne Zoo lets you see some of the world's most amazing creatures in a huge range of exhibits. St Patrick's Cathedral is a must see, and its spectacular Gothic-revival style architecture makes for some awesome holiday photos. The best view of the city is from the top of Eureka Tower. From the 88th floor you have a 360 degree panorama of Melbourne that's simply breathtaking. To escape from the city, you can't pass up the chance to visit the Dandenong Ranges. Follow peaceful walking tracks into the lush rainforest and let the tranquillity of nature revitalize you. The "Puffing Billy" train ride here is also fantastic, where you can enjoy a leisurely ride through the picturesque mountains. Fawkner is a wonderful part of Melbourne to stay in during your next visit to the city. This suburb is just far enough removed to let you enjoy real local life, while being close enough to all of the great attractions in town. Check out what we're offering on Fawkner accommodation and flights to Melbourne, and grab a deal on your next Victorian holiday. Wot are you waiting for? How Much is a Hotel Room in Fawkner? 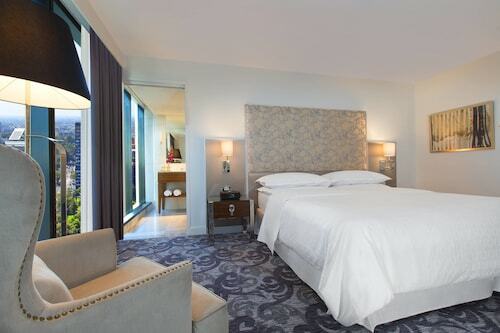 Hotels in Fawkner start at AU$58 per night. Prices and availability subject to change. Additional terms may apply.